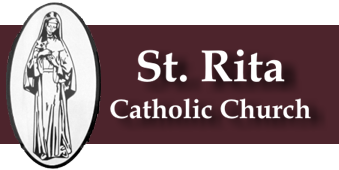 “WALK OF FAITH” – St. Rita’s celebrated 50 years in our current Church building in 2014. As our number of parish families continues to grow, we find ourselves in need of a larger gathering area for our parish members to congregate and converse after Mass. In response to this need, a beautification project has been initiated to include additional “hardscaping” to the front and side of our Church. Within the new landscaping and hardscape areas, a special “Walk of Faith” is planned to incorporate engraved pavers that offer each of our parishioners the chance to purchase a personally engraved stone for your family or in memory of a loved one, or to honor a Saint. Sale of the personalized stones will help fund this beautification project. Although construction is completed, pavers will always be available to order, as engraved pavers will be used to replace blank ones. A portion of the funding for this beautification project is from the proceeds obtained from the Annual St. Rita’s Gala & Silent Auction for the past 3 years. Thank you for your consideration in taking part in this parish initiative. © 2019 St Rita Catholic Church.